1. The speed of the transverse wave on a 25 meters rope is 50 m/s. 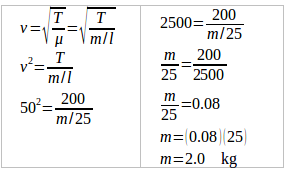 The tension force of the rope is 200 N. Determine the mass of rope. This problem can be solved using the formula of the wave propagation formula on the rope. The first timber has moved up and down three times; the second wood just moved up and down one time. When the first wood moves up and down one time, the wavelength 1 travels to the second wood. When the first wood moves up and down two times, the wavelength 2 travels to the second wood. When the first wood moves up and down three times, the wavelength one has arrived at the second wood position so that at the same time the second wood moves up and down one time. Thus, the distance between the first wood and the second wood is two wavelengths (2 λ), as shown in the picture on the side. 5. A cork on the surface of water moves up and down due to the surface water waves. The time required from a crest to next crest is 1.2 seconds. If on the water surface, the distance between two crests is 10 cm, then determine the speed of the wave propagation. The time required from crest to the next crest = the time interval for one wavelength = period (T) = 1.2 seconds.